If Pluto's looking for someone  or something  to blame for being drummed out of the planetary corps back in 2006, it need look no further than Eris. The solar system's ninth planet had long had its detractors  purists who sniffed at its tiny size and irregular orbit  but it was in 2005 things came to a head. That was when Caltech astronomer Mike Brown found a tiny, frigid world orbiting some three times further out than Pluto. Brown had been finding similar objects in the Kuiper Belt  the massive band of comet-like bodies that circles the solar system  for years. But all of them were smaller than 2,320 km (1,440 miles) across, the modest dimensions of Pluto. Eris (which Brown nicknamed Xena, before the International Astronomical Union settled on its official name), though, was evidently a little larger  and that discovery set off an international furor. If Pluto was a planet, Eris obviously was too. And if so, why not Quaoar and Sedna, and several other worlds, which were smaller than Pluto, but not by much? In the end, the astronomical union avoided the whole mess by demoting Pluto and the rest to the status of "dwarf planet," infuriating Pluto partisans around the world (an odd category, when you think about it: there are no rabid fan clubs for Jupiter or Mercury or Mars). Brown ultimately poked Pluto lovers again when he wrote a book titled How I Killed Pluto and Why It Had It Coming. The one hope Pluto fans had for revenge was that it was very tough to pin down Eris' size exactly. Maybe it would end up proving smaller than Pluto after all. That wouldn't restore Pluto to full planethood, but it would make them feel better, anyway. Now a team of astronomers has finally nailed down Eris' size with high precision, and the answer is that it may be bigger than Pluto, or it may not  but the difference is probably pretty small either way. Much more significant, says Bruno Sicardy of the Paris Observatory, lead author of a paper on the discovery in the latest Nature, is that despite their comparable size, Eris is some 27% more massive than Pluto. What's more, it's prettier, with a surface Sicardy describes as "brighter than new fallen snow." Measuring the size of something 24 billion km (15 billion miles) away is no mean feat. It is, says Sicardy, "like measuring a coin at a distance of 100 miles." Even with the Hubble telescope, Eris looks like a featureless pinpoint. The only way to gauge its size accurately was to wait for it to pass in front of a distant star, in what's known as an occultation. All you have to do then is time how long it takes the star to reappear on the other side and you can calculate the size of the obscuring object. Two years ago, Sicardy and his team found a good star in what seemed to be the right spot  but they couldn't be sure the two bodies would actually cross paths until it was about to happen. "You need to know the location of the star and the orbit of Eris very, very precisely." Fortunately, they chose well. Last November, the occultation took place. "It's amazing it works!" says Sicardy, who knew better than anyone how hard it was to predict. "The star disappears and then reappears!" 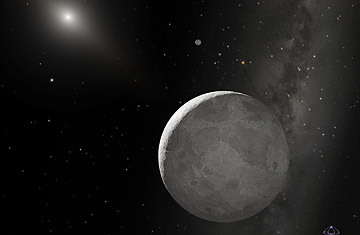 If the occultation had been spotted from only one telescope, it wouldn't have been very useful, since the star might have barely skimmed Eris' edge rather than passed behind its fat middle. But two telescopes, both in Chile, managed to see the event take place. They were far enough apart and saw it from different enough angles that they captured different parts of Eris. Assuming the object is roughly spherical (not unreasonable), they could use those parts of the overall disc to trace out the rest and thus calculate its size. The answer they got: 2,326 km (1,445 miles), with an uncertainty of half a percent. That margin of error actually straddles Pluto's accepted dimensions. At its greatest possible size, Eris is bigger than Pluto; at its least, it's smaller. Such exquisite mathematical ambiguity is made less certain still by the fact that unlike Eris, Pluto has a thin atmosphere, so when it goes in front of a star, the star doesn't wink out. It fades. Pluto may be a few tens of kilometers smaller than Eris, or a few tens of kilometers bigger. Whatever Pluto's exact dimensions, the fact doesn't have much significance beyond cosmic bragging rights. What does matter a lot is Eris' surprisingly large mass, which means it has considerably more rock underneath its icy surface than Pluto. As Brown writes on his blog, "explaining why Pluto and Eris are so different is going to keep us busy for many years, I suspect." Scientists also have to explain why Eris is so blindingly bright. Its surface should darken over the years as dust and cosmic rays mar its pristine whiteness, and yet it's kept its youthful sheen. The answer, the scientists suspect: when Eris comes closer to the sun in its highly elongated orbit, surface ice warms up to form a temporary atmosphere. When it recedes, the atmosphere condenses again to form a new coating of ice just a millimeter thick. "Unfortunately," says Sicardy, "we will have to wait 250 years to test this idea." But Pluto is currently moving further out, so the same thing might happen to it in reverse. "Within 20 years or so," he says "we could see Pluto begin to brighten" as its atmosphere starts to freeze out, confirming the hypothesis. Astronomers won't have to wait that long to firm up their understanding of the outer solar system, though: Sicardy and his team already have occultations in hand from other Kuiper Belt objects. Measuring their size and density will help theorists figure out how these miniworlds came to be. Brown, meanwhile, holds out an even more exciting prospect. "There are surely even larger dwarf planets out there," he writes. "It is only a matter of time before both Pluto and Eris are supplanted." Presumably, one hopes, before Eris develops a fan base of its own. See how Pluto's sister planet was discovered.